On 13th Jan 2014 Scientists in Japan simulated one per cent of the neuronal network in the brain using the K computer, the fourth most powerful supercomputer in the world. 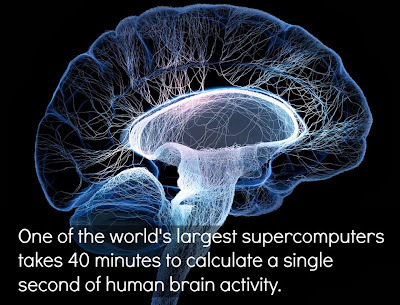 With 705,024 processor cores and 1.4 million GB of RAM at its disposal, the K computer took 40 minutes to model the data in a project designed to test the ability of the supercomputer and gauge the limits of brain simulation. The project saw teams from the Japanese research group RIKEN and the German Forschungszentrum Jülich centre collaborate to use the Neural Simulation Technology tool, replicating a network of 1.73 billion nerve cells and 10.4 trillion synapses. This is the best attempt to approach the hidden nature and evolving human brain. Our brain and brain function is the biggest mystery.It is the best product of evolution.